Hi! I'm Hannah, I’ve been writing professionally for eight years and I'm a native English speaker. I have an extensive knowledge of diet, health and wellbeing topics...Read moreHi! I'm Hannah, I’ve been writing professionally for eight years and I'm a native English speaker. I have an extensive knowledge of diet, health and wellbeing topics and consistently produce high quality, fully researched content for blogs, features and articles. I have work published both online and in print and I have a 2:1 honours degree in Human Biology. I’ve always loved to write, and after spending the first ten years of my career laboratory based, embarked on a career change in 2009 by joining an innovative and first to market online doctor. I was responsible for managing all online and printed content including articles, product descriptions and marketing materials, and now have extensive knowledge of what it takes to write engaging, imaginative pieces. In 2013 I had a major role in setting up https://www.emmbie.com and have had overall responsibility for all content (including the blog and product descriptions), social media and printed materials. Emmbie is an online health, diet, fitness and lifestyle company selling natural, organic, vegan health food supplements. I also have experience in proofreading and editing content written by doctors, making sure it reads well as a non-doctor and am fully versed in being consistent with editorial guidelines. My writing style is fun, engaging and consistent and I have a knack of giving a dry subject an interesting spin, and making the complex, easily digestible. My English grammar, spelling and punctuation is excellent and my work will pass through any plagiarism software. 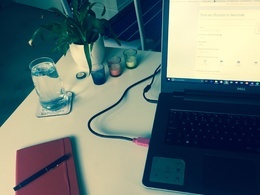 I’m motivated and well organised for freelance working, my desk shares a space with a running machine, which often comes in handy when I’m told by my watch I’ve been sitting down too long or need some inspiration away from the screen! I try to live a simple life, always conscious of my impact on the environment and have recently taken a keen interest in Buddhism. I choose natural beauty and household products and eat local, organic produce when I can. Staying true to both my way of life and my scientific background, I have a passion for writing on these subjects that is evident in my work. Thanks for your time, and I look forward to hearing from you soon. Hannah did a great job for us. Very nice blog and worked well to the brief, in brilliant time too. Thank you! Thank you Saj, my pleasure! Hannah is well able to execute a brief to a high standard and efficiently. She is a great communicator and pleasant to work with. Very happy with the work that has been sent over! Great work again from Hannah, fully understood what we were looking for and turned the project around quickly. Has been brilliant to work with. Understanding and turning round a 1000 word article, which needed research out of her normal domain. Another great job thank you! Hannah was great to work with! She's always very courteous and prompt in her communications. As well as having a great sense of humor, she is very astute in her ability to make logical connections to my thought process. I will continue to use her as a trusted source of reason, as well as penmanship. Tom K.
Cheers Tom, the pleasure was all mine! Hannah was great - very quick, clear, responsive communication and fabulous writing. Cheers! A fun, upbeat and inspiring blog post about cooking. Hannah smashed it yet again - look forward t workong with her sgain in the future. Ah cheers Ross, Happy Christmas! Hannah smashed it as always. A total pleasure to work with. Would highly recommend. Another great experience with Hannah!